The price of copper whipsawed in recent months, leaving investors baffled. Copper prices had climbed steadily since 2016, peaking at $3.30 per pound in June when workers went on strike at the massive Escondida copper mine in Chile. With talks progressing, a resolution seems to be in sight. The price of copper should have eased back down to its prestrike high. Instead, it crashed 16% in a month! We need to understand Wall Street’s take on copper before we know whether this is an opportunity to invest or a warning to get out. Fortunately, there’s a useful metric for gauging investors positions: the weekly Commitment of Traders (COT) report. The COT provides a snapshot of investors’ positions in a commodity. Every time the COT hits close to a high in its range, there is a pullback in the price of copper. Simply put, investors are fully bought in. A shortage of buyers means investors must sell for less. As investors pour out, the price falls. June saw a new high in the COT. A pullback was imminent, but it was sharper than usual for political reasons. The protracted trade war between the U.S. and China is beginning to weigh heavily on the minds of investors. Copper is a base metal. It is one of the key building blocks for economic growth. The red metal is in every electronic device, building, car and power line across the globe. It is a great conductor of electricity and is a key ingredient in the revolution in transportation. Investors view it as an indicator of economic growth — especially for China. China consumes approximately half of the world’s copper. That means the price of copper partially reflects investors’ forecast for China’s growth. Trade wars aren’t good for economic growth. With hundreds of billions worth of goods earmarked for tariffs, investors worry about the drag on the global economy. Continued escalation of a trade war could weigh on prices further. There is a common expression in investing to never try and catch a falling knife. 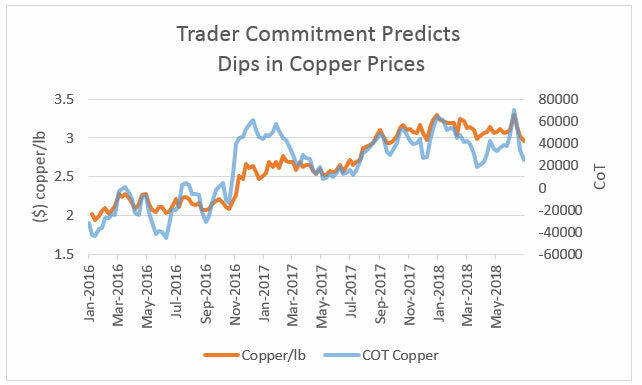 A resolution to the trade war, on the other hand, could send copper rallying 15% to around $3.20 per pound. That was the price before concerns of a trade war took their toll. At Real Wealth Strategist, we are playing defense with our copper positions, with an eye on the opportunity up ahead.